Welcome to the home of Gardening with Children - a website specially designed to be an interactive classroom, allotment plot, and hobby garden of 21st century. Here you will enjoy the real benefits of sharing your goodness with the environment around you. Grow you own food, enjoy nature and care for wildlife in winter. You will be introduced to home farming and taught how to observe nature. Why not enter one of our regular competitions featured on the site? Teachers love them for the prizes they win and there are competitions that can involve the whole family. Every week Gill, our resident expert writes news and tells us all what's good to do in the garden and provides really interesting and exciting seasonal activities. Her blog posts are loved far and wide and Gill is an avid gardener and Grow Your Own enthusiast. If you want to know what she looks like check her out on the Ask an Expert page. 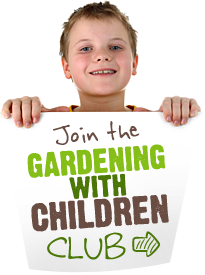 Join our Schools Gardening Club and reap the benefits of regular news and discounts on gardening equipment. 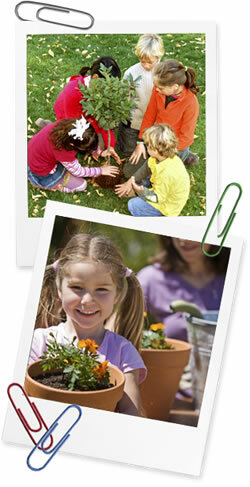 The Gardening With Children Gardening Club is becoming a worldwide club as schools join us from all over the globe. It is all very exciting! Furthermore, Gardening with Children has been developed to encourage schools to communicate with each other by submitting news and pictures to the site. Sharing and communicating is what this site is all about so please keep us up to date with what you're doing. Whether its playground gardening, growing vegetables or keeping hens and pigs, we want to hear it from you!